 Particularly significant qualifying information should be given sufficient emphasis; this may include holding certain information on screen for longer.  A stricter approach to contrast between the supers and background should be taken.  Use of shadowing and edging effects to improve legibility will be further discouraged owing to its potential to blur text.  Greater care should be taken over the choice of typeface to avoid the use of ‘stretched’, elongated text.  Supers should be placed at the bottom of the screen and centred.  Shorter, centred supers are preferable to the use of full-line supers.  Marketers must take care to avoid a detrimental impact on viewers when their attention is drawn to other ad content, including imagery or written messaging, at the same time as a super.  Where numbers are presented in a super, viewers should not be expected to make additional calculations in order to have full understanding of the information presented. There will be a two-stage transitional period. The revised guidance will come into effect on 1 March 2019. 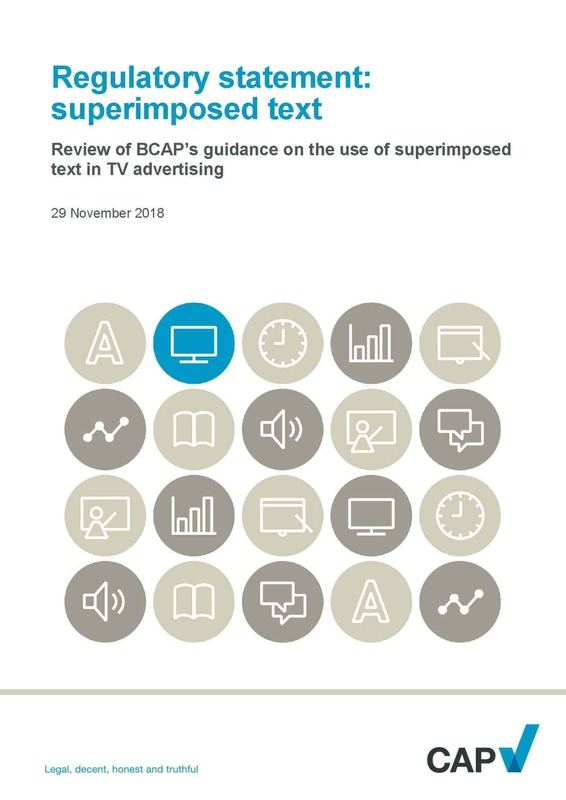 Initially, the ASA will seek to resolve cases informally, issuing advice based on the guidance to advertisers on how to improve potentially problematic supers. It will start to consider cases formally from 1 September 2019.